Summer is for beaches, Fall is for the leaves, and the Holiday season is for Hallmark movies. Those Hallmark movies always seem to take place in the most picturesque little holiday towns. Happy locals that know everyone, Christmas lights everywhere, carriage rides, cute restaurants with friendly staff and amazing food, adorable family-owned one-of-a-kind shops, and, of course, top it all off with a little romance. What if I told you that all of the above could be found in America’s Coolest Small Town: Berlin, Maryland! Although you might have to create your own romance when you’re here, we supply the other Hallmark-like settings, and so much more! So join me as I tell a tale made for Hallmark about Berlin, Maryland, your Holiday vacation destination! Voted America’s Coolest Small Town, Berlin has grown from a small little town founded in 1790s click here for Berlin’s history, to a vibrant community full of art galleries, antique shops, tree lined streets, breweries, and historic restaurants and landmarks. The historic charm overflows throughout the town and you can’t help but be in awe as you walk down the street in all that Berlin has to offer. Around our town, Sundays are for brunch. And if you want to brunch with us, there’s no better place than the historic “Atlantic Hotel,” built in 1895, or cultural hub “The Globe” (CLICK HERE FOR INFO), featuring local art galleries and live musical entertainment daily. Both offer award-winning brunch menus, and each offer their own brunch experience, you can’t go wrong starting your Sunday off brunching at one of these two places. After you finish up your brunch, and maybe having a mimosa or two, catch a ride around town on a free carriage ride. During December one of the best ways to experience the town is on your very own carriage ride. Taking you throughout town to see all the sites and sounds, Berlin’s free carriage rides are offered Saturdays and Sundays from 11am-3pm all December long. It’s a great way to experience the whole town of Berlin. While on your ride, scope out all the places you want to see and plan your next move! Of course, we think the best way to enjoy the town is on foot. With each step you take you’ll see a unique storefront inviting you in to experience a one-of-a-kind store. All of the shops in Berlin are locally owned, offering up a shopping experience you can’t find any where else. The list is long, but each store is definitely worth a visit. Berlin offers shopping experiences that include antique shops, home goods, various clothing stores, jewelry shops, art galleries of various types, and so much more. CHECK OUT A FULL LIST OF OUR STORES AND SHOPS HERE. Beyond the everyday charm of Berlin, Maryland, the town puts on a few holiday events that are a must see! We kick off our holiday season with a beautiful tree lighting for all to see. 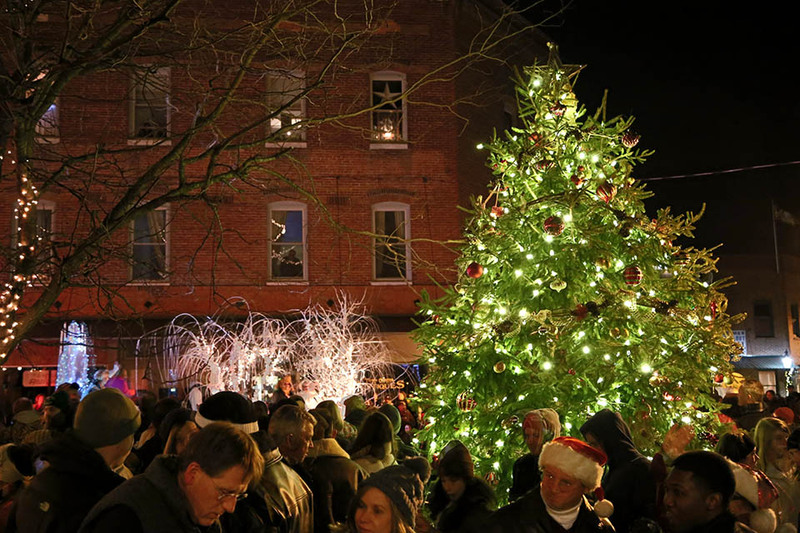 Taking place this year on November 23rd, the tree lighting brings a joyful crowd to the town to gather and celebrate the countdown to Christmas. Shops and restaurants stay open later for this event so you can enjoy the town under the bright lights and cool night’s stars. Beyond the Christmas tree, the town is full of holiday decorations with each shop decorating their storefront in their own personal way. The town truly lights up! So much so I’ve been told Santa comes to Berlin first because it’s so visible from the sky (don’t quote me on that). 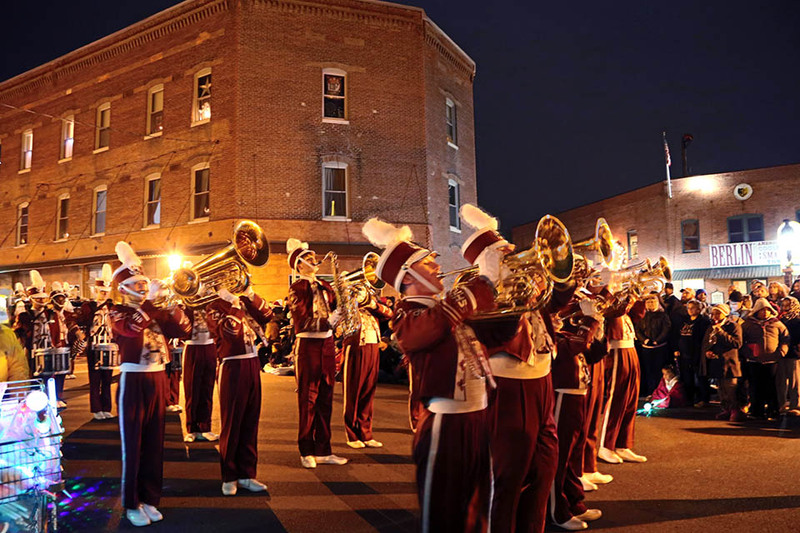 The biggest holiday event in town has got to be the annual Christmas Parade (CLICK HERE FOR INFO) held on Thursday, December 6th. This year will be the 48th annual Christmas Parade, and we’re certain it’ll be bigger and better than ever before. For this event we shut down Main Street and a cheerful crowd sets up eager to watch a plethora of bands, floats, fire companies, and others march down the street in Christmas celebration. Bring a chair, a blanket (or two), and some hot chocolate and enjoy a night of merry celebration. There’s so much to do around town and with all the cheerful locals and friendly vacationers, it’s a wonderful place to be during the holiday season. If you’re still not convinced, check out the town’s Instagram page (CLICK HERE TO VIEW PAGE) and see all the fun we have in America’s Coolest Small Town: Berlin, Maryland. We invite you to join us and create your very own Hallmark experience in our fun little town, Berlin.